C-SPAN Classroom is one of my go-to sources of ideas for lessons on current events related to U.S. government and politics. Membership in C-SPAN Classroom is free and provides members with lots of digital and physical resources. 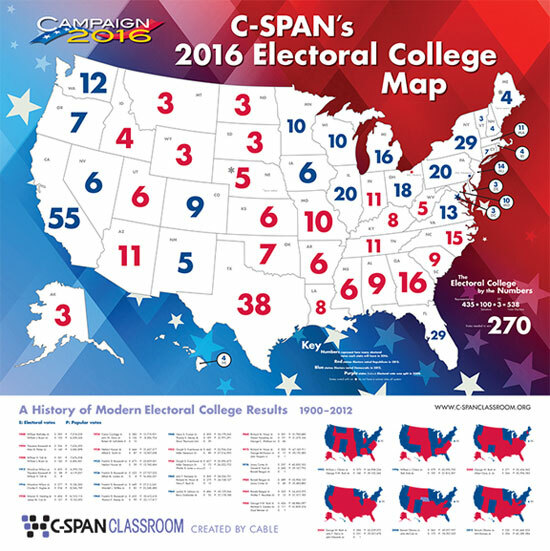 One of the resources C-SPAN Classroom is currently offering to members is a poster about the Electoral College. C-SPAN's 2016 Electoral College Map shows the number of Electoral votes each state has in 2016. The poster also includes the Electoral vote and popular vote tallies of the every election dating back to 1900. You can get a copy of the poster here. The poster on its own is nice, but students will need some guidance in understanding what all of the information really means. 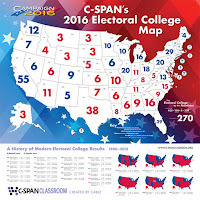 To that end C-SPAN Classroom offers a set of guiding questions to use with your students in conjunction with the 2016 Electoral College Map.